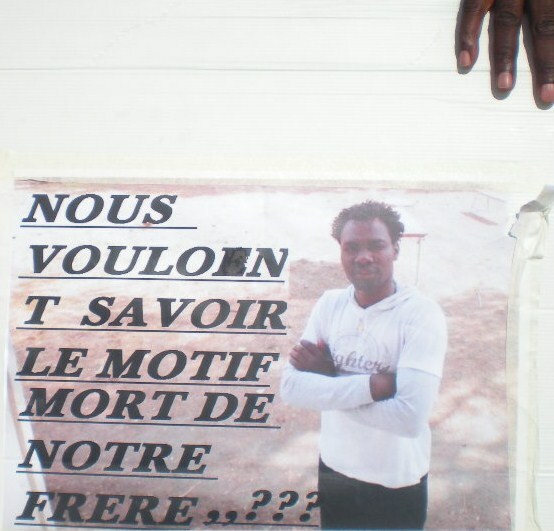 Our friend Noureddin Mohamed died in the centre of Calais in the early hours of Saturday morning (7 July 2012). Noureddin was 28 years old. Originally from North Darfur, Sudan, he had been in Calais for more than four years. He was well known and loved in Calais, and leaves many grieving friends. He died just some 200 metres from the Sub-prefecture (government office) where he had recently been granted leave to remain in France as a refugee. That night, Noureddin had been out with a group of friends in the town centre. But a normal night out in Calais, if you are black or look “foreign”, means the constant danger of harassment and aggression from the police. In Calais companies of CRS riot police patrol the streets night and day with specific orders to stop anyone who looks like a migrant, and arrest anyone who can’t show the right travel documents. Despite a recent French appeal court ruling against such racist policing (see notes), nothing has changed. According to Noureddin’s friends, as they left a bar near the main street Rue Royale, they were once again stopped aggressively by the police. Refugees are used to this treatment in Calais, and generally shrug it off. Noureddin and his friends split up, and Noureddin left alone on his way home. Minutes later he was dead. At 3.30 am, his body was dragged out of the canal 200 metres from the Sub-Prefecture. Noureddin’s friends do not believe that his death was an accident. And they do not believe the official story, which was immediately parroted without further investigation by the local press. According to the police, Noureddin stole a mobile phone from a woman, her friends chased him, and Noureddin jumped into the canal where he drowned. Everyone who knew Noureddin insists that he was not a thief, and had never done anything like this. Nor do they believe that he simply “jumped”. The police have provided no evidence for their story, except the word of the three people who are supposed to have chased Noureddin. We cannot say, at this point, whether the police were involved in Noureddin’s death. We do not currently know the truth about the three people who are supposed to have chased him. We do know that racist attacks against migrants are all too common in Calais, sometimes involving local fascist groups, as well as the police themselves. Whatever happened that night, Noureddin’s death deserves a proper investigation. Instead, the case was closed immediately, and the police have refused to perform an autopsy. On Wednesday (11 July) Noureddin’s uncle submitted an official demand to the state prosecutor for an inquiry into “murder by persons unknown”. According to legal counsel, this demand means that the authorities should now perform an autopsy and reopen the investigation. So far, though, there has been no official response. Every day this week, friends, family, and their supporters have held demonstrations demanding justice for Noureddin. On Tuesday (10 July) around 60 people – not only Sudanese but Afghan, Eritrean, French, and others — demonstrated outside the central police station. They were met by a show of force including around 20 CRS riot police, with flashball guns, who blocked off all the streets around the areas. Undeterred, on Wednesday (11 July) members of the Darfuri communities from Paris and Belgium arrived to join another demonstration outside the Town Hall. They carried placards with pictures of Noureddin, demanding “We want to know the reason for the death of our brother.” The mobilisation continues today (Thursday 12th), and solidarity demonstrations are also planned in Paris, Lille, Germany, London, and elsewhere in the coming days. Noureddin’s story is far from unique. There is no accurate count of how many migrants have died in Calais, their deaths ignored, the facts covered up or altogether unreported. Just to give one recent example, Noureddin’s story raises grim parallels with the death of a young Eritrean man, Ismael, whose body was found at the bottom of another canal bridge on 22 December. The police immediately closed the case, writing it off as suicide, without any evidence for this conclusion. Again, the authorities refused an autopsy or any further investigation. Ismael had no family members nearby, the police refused to let his friends even see the body, and threatened them with arrest by immigration authorities if they returned to the police station. Eventually one white friend, a French citizen, was allowed to identify the body. In the case of Zenebe, whose body was found on 9 April in the deserted lace factory where he was living, the police do claim to have launched an investigation, but there has been no outcome from this so far. On 22 April 2011 the body of a 24 year old Afghan man was dragged from another canal in Calais. Again, the police claimed he had drowned accidentally. He was being chased at the time by immigration police (PAF) officers. The deaths in Calais are just a few of the many lives lost at Europe’s borders. According to the press monitoring researchers of “Fortress Europe” blog, at least 18,244 deaths at European borders have been reported by media since 1988. Many more, for sure, go unreported. Most of these die in the Mediterranean sea. On Monday night (9 July) a young Eritrean man was rescued off the coast of Tunisia, the sole survivor of a boat carrying 55 Eritrean, Somali and Sudanese refugees. In the most infamous recent story to come to light, over 60 African refugees died as their boat drifted for 11 days in March 2011. The boat was in contact with the Italian coastguard, a military helicopter (country unknown) flew over and lowered bottles of water, and finally it drifted in full view of an aircraft carrier, probably the French ship Charles de Gaulle. No one came to their rescue. In Calais as in the Mediterranean, as at the Greece-Turkey border graveyard of the Evros valley, the lives of migrants from Africa and Asia are not worth saving, their deaths are not worth recording or investigating. Police and other state authorities are often actively involved in these deaths. Other times, they are merely complicit. Police and other officials cover up killings of refugees and refuse to investigate suspicious deaths. A migrant’s death doesn’t mean the same as a citizen’s. Because a migrant’s life is not worth the same as a citizen’s. It is not only the state authorities who are complicit in these killings at the border. Amongst others, we should note the role of the media. Not all deaths in Calais are even reported. But as Noureddin’s body was found in full public view in the town centre, his death couldn’t be ignored. Both local newspapers (Nord Littoral and Voix du Nord) immediately ran the police story. The supposed “theft” of a mobile phone was reported as fact. Journalists made no attempt to investigate further. No one tried to contact Noureddin’s friends and get their side of the story. Noureddin was immediately written off as a thief and his death as an accident or even, perhaps, a well-deserved end. This complicity in silence and slander makes the life of a migrant cheap. Racist police officers know that they can beat, chase, and continually harass migrants without fear of sanction. As people were leaving Tuesday’s demonstration, one CRS (riot police) officer called after them: “be careful you don’t fall in the water”. It’s certainly clear for “civilian” racists and fascists, too, whose side the authorities are on. So long as deaths go without acknowledgement or reply, it’s open season on migrants in Calais. The mobilisation in Calais this week has seen demonstrations every morning outside the police station and town hall, with Darfuris now coming from Paris and Belgium to join the demos. In the repressive conditions of Calais, it takes courage to come out and demonstrate on the street if you don’t carry the right papers. But anger, sorrow, and solidarity overpower fear. The anger and protest now begins to spread, amongst Darfuri communities elsewhere in France and beyond, and to other migrants and friends. Can this become the start of a movement against the border killings? Will we find the strength to say “Enough”? Justice for Noureddin, and for all our sisters and brothers on the borders. Today, the Sudanese community assembled in Park Richelieu. From 09.00 onwards, people came alone or in groups in the park. At 10.00, Breakfast arrived. The police had sporadic drives through the park, but no CRS/PAF (Riot-/ Border police) showed up today. At 11.15 we walked to the front of the Park. After a short assembly there, we marched to the place, where Nourredin died. It was very emotional. We then marched to the town hall (Hotel de Ville). There, speeches in English, French and Arabic were held. The police was present, but again, all very low key. Today, the community also changed the solicitor, the previous one being on holiday. The prosecutor told a local right wing newspaper that he will definitely not be ordering a autopsy. Very independent, this man. Tomorrow, we will come together again. Justice for Noureddin, justice for Ismael, Justice for all the others. Did you know that since 2002 over 100 people have died in Calais? Some died by trying to come through this inhuman border, some died through suicide, some… will we ever know? By the way, that’s one person every month. What has to happen before the public wakes up? On Tuesday, there will be a demonstration in London, organised by the Sudanese/Darfur community. A press release will come out tomorrow. Whatever we do, I’m sure, nobody will forget Noureddin, no-one will forget Ismael, nobody will forget all the others who died, direct or indirect as a result of the system and its minions. Some members of Noureddin’s family , as well as about 50 members of the Sudanese community and No Borders and different associations, Medecins du Monde and Secours Catholique assembled this morning in the Park next to the Police station . The Police turned up controlled everyone’s ID including activists and one of them said to the Sudanese “Be careful you don’t fall in the water” (yes, believe it or not he did) . Then everyone left the park and went to the Police Station where Noureddin’s uncle and the interpreter were waiting. We waited outside as they went inside to identify the body and to demand an autopsy. The Police did not appreciate that we arrived with tea and coffee. The situation became tense as the chief of the Commissariat came out and told us to move across the road claiming that we were obstructing public access . We refused and there was a small stand off . The CRS arrived and stood guarding the entrance .They had a riot shield and a flashball gun like they meant business but it was really just an exercise in intimidation. The entire time we were filmed and photographed but we were filming back as hard. Then another man in a suit arrived who seemed to be the press officer. We then had a very heated discussion . They claimed that there was no need for an autopsy as the case was closed . The Police Coroner had not found any marks on the body so there would be a verdict of accidental death . As the conversation developed it quickly became clear that this was entirely false as they contradicted each other . To order an inquest it is essential that the uncle ‘porte plainte contre X’ (make a complaint against an unknown person) and they admitted this as a possibility but it has to be done through the Procureur (de la republique) in Boulogne. We waited about two hours for the uncle and the Secours Catholique translator to come out having identified Noureddin’s body . They told us that the the Police had asked them to sign a release paper to accept the body back . The Police had said that if they did not sign the Police paper that they would not be able have the body to send to Sudan . Fortunately they did not give into this blackmail and were forced to take the painful decision not to sign meaning that Noureddin’s body will now be buried at Coquelles cemetery in a communal grave. The point being that signing would have in fact closed the case even though the Police attempted to persuade the interpreter and the uncle that this was not the case and that it would be possible to ‘porter plainte’ afterwards. During the day two new versions of events surrounding Noureddin’s death were given to the Sudanese community. In the first scenario the girl owner of the mobile phone pushed Nouredin into the canal and was under arrest . In the second version Noureddin simply ran out of the nightclub and committed suicide by jumping into the canal. After the uncle and translator came out of the Commisariat there was a second stand off as we were by this stage occupying the closed road . About 20 Police advanced towards us and pushed us back there was some good resistance but eventually we decided to move on to get more detail and to discuss. Eventually the uncle decided that he did want to porte plante and this was done together with the translator and a document testifying to this was given a member of the family. We’ve called some local media we can trust (not many) and there are a couple of journalists here but it would be great to have more so if you know anyone who’d be interested that we trust and is available on very short notice to get here then it’s worth a try. Not because it bears any relation to the truth, but this is the official line: N stole a mobile phone in the town centre, he was chased by a friend of the “victim”, and somehow he managed to fall or jump into the canal, where he drowned. Apparently there is no need for an autopsy or inquiry. No need to explain police movements that night just before N died. No need to wait for evidence that he stole anything. This story, straight from the mouths of the cops, was parroted by the local hate-rag “La Voix du Nord” without further investigation. A migrant. A black man. A thief. An accident, maybe even a well-deserved death. N’s friends, and witnesses, tell a different story. We cannot write more about what really happened at this moment, but we will do so soon. 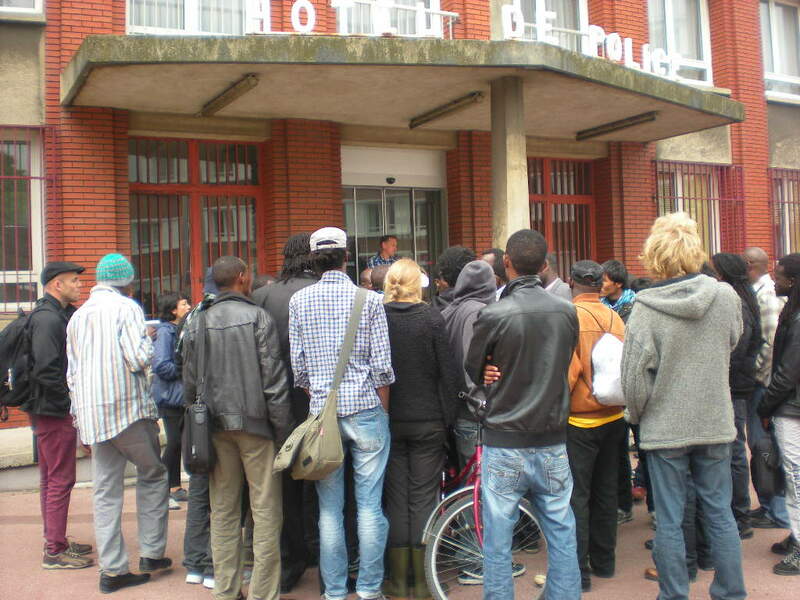 This morning (Monday 9) around 40 people demonstrated outside the police station in Calais. N was well loved. We hope to write more about his life soon as well, with full respect to all his family and friends. We will not let this death be forgotten. The cover-up by state authorities and media accomplices of deaths in Calais is standard. Just to give another recent example, on December 22, another friend, Ismael, was found dead at the bottom of a bridge in central Calais. The police immediately closed the case, calling it suicide. They refused to allow his friends to see or identify the body, and refused an autopsy. Ismael’s friends went twice to the police station asking to see his body and were twice refused and threatened with arrest by the immigration police (PAF) if they didn’t leave. Only one white French friend was allowed in to identify him. There was no further investigation. The border kills. We don’t know how Ismael died. We have seen many times police chasing migrants off bridges, into canals, into the harbour. Bullets and clubs are not the only way to kill people. A fall from a bridge can kill just as well. Constant beatings and hunger can kill just as well. Years of fear and frustration and humiliation can kill just as well. These are the deaths that keep Europe’s looted wealth safe from the foreigners. There will be a further post to come soon.